The winter can be rather cold, but that doesn't stop Troop 145 from heading outdoors. Our January campout will be at Natural Bridge Cavern. We will be exploring the cave and zip lining!! So excited! Check out the Troop Calendar to see the campouts already planned, then add the calendar to your Google account and be up to date with any new campouts that are added. New to scouting and want to sit in on one of our Troop meetings? Then send an email to scoutmaster@bsatroop145roundrock.org Come join the fun and adventure! 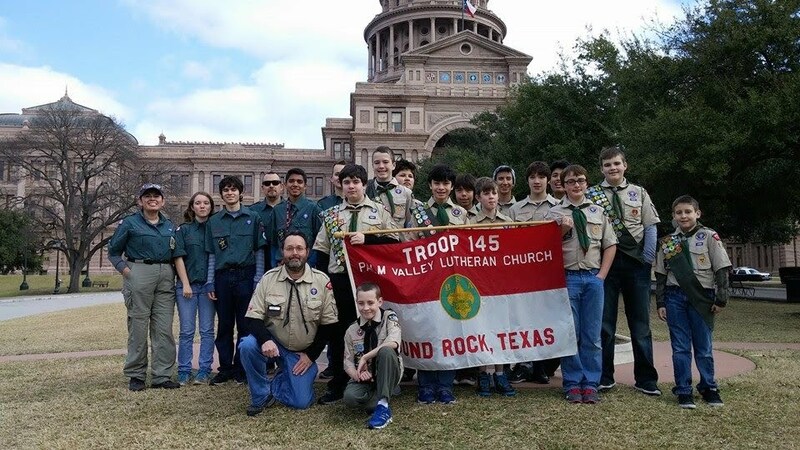 Troop 145 is a boy run Scout troop located in Round Rock, Texas. With 40+ scouts, and active adult involvement, this troop has consistently been recognized as a quality unit for over 25 years. Come and visit at our weekly meetings or monthly campouts! Troop 145, the friendliest, busiest troop around! The Troop is sponsored by the historic Palm Valley Lutheran Church of Round Rock located on Highway 79 near Old Settler's Park and the Dell Diamond. We meet Monday evenings year round from 7 PM to 8:00 PM in the Church's Fellowship Hall. Need access to the Private Website? Forgot your Private Website ID or password?